Innotech’s Gap Cutting Sheeter enables cutting sheets trimmed to size, avoiding the need to take a guillotine cut to remove non-print area, color bars or to achieve a different length than the press repeat. The Sheeter is designed to cut and remove one or two trim chips per repeat length and thus produce flat as well as folded, bleed cut pieces. The Gap Cutting Sheeter has a unique patented cutterhead that is mounted with two double knife holders. Each double knife holder is machined to cut a specified chip that is drawn into the internal passages of the cutterhead by vacuum connected to the stationary ends of cylinder for removal by customer’s trim removal system. The size of chip varies from ¼” minimum to 1” maximum. The gap cutting feature is available on Sheeters and Rotary Cutters for fixed or variable size presses. The patented cutterhead has streamlined internal passages and requires relatively low vacuum to pull the chips. 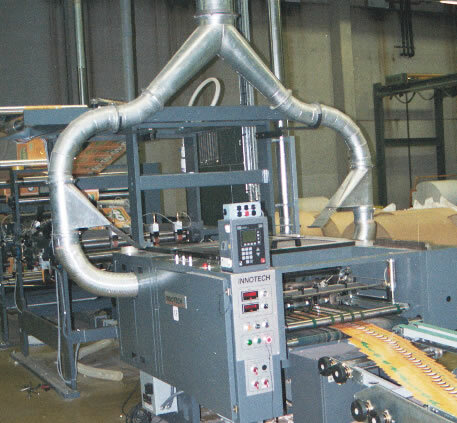 Addition of one or more INNOFORMER™ folding stations before Sheeter enables production of bleed trimmed 4 pagers as well as various folded products. By combining features of a Sheeter and a Rotary Cutter in one machine, Gap Cutting Sheeter offers unparalleled versatility to printers.